Most working and recreational horse barns feature at least one round pen. Round pens are used to exercise horses as well as teach horses basic manners and skills in a controlled environment. Round pens provide a limited amount of space in which a horse can be effectively worked in a circle. If your barn does not have a round pen, you have several options for building one. A round pen is essentially a small, circular riding arena. It is most commonly used for free-lunging, whereby the horse is exercised while running in a small circle around the handler. Round pens should not measure less than 30 feet in diameter or more than 120 feet. Round pens that are 50 or 60 feet in diameter are common because they have plenty of room for a rider and horse to work in without being so large that the horse can not be controlled at all times. Round pens have walls or rail fences that are at least 4 feet high and feature at least one gate, usually a fairly small gate that is designed to allow one horse to enter and exit comfortably but is too small for multiple animals or for large vehicles to drive through. You should not ever have more than one horse in a round pen at a time. Galvanized portable steel panels are sold to contain livestock and form a portable fence or corral that you can move and reassemble as many times as you want. These panels are also called round pen panels; they make construction of a temporary sturdy and functional round pen simple. Metal round pens are more costly than other types but they are portable, easy to assemble and can be added to or adjusted in size as necessary. These round pens are also very durable and can withstand a significant amount of abuse. You can build a round pen out of any type of fencing materials you wish to use, though electric fencing is not recommended because horses occasionally brush up against the side of the round pen while exercising. The posts for your round pen should be between 8 and 16 feet apart. Railing stretches between each post. Permanent pens cannot be transported but are normally less expensive to construct than metal panel pens are to purchase. 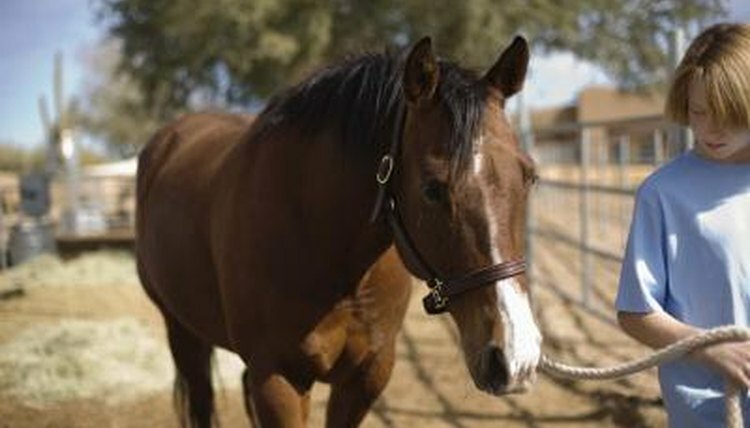 The downside of a permanent round pen is that you cannot move or change it once it is built. If you choose to build a permanent round pen, you will need to decide how far apart you want your posts to be. Your posts should be no less than 8 feet apart and no more than 16 feet apart. The closer the posts are together, the sturdier the round pen will be. Before you start constructing or assembling any type of round pen, you will need to select the location for it. A round pen should be on a high piece of ground that is not prone to flooding and is level. If the ground is not level, you will have to bring in dirt to make the area level before you build. The footing in your round pen is essential to the usefulness of the pen, so make sure to use firm footing with good drainage that does not trap water. You need to make sure the gate on your round pen is large enough that you can get a drag into the pen to level out the footing after each use of the pen.